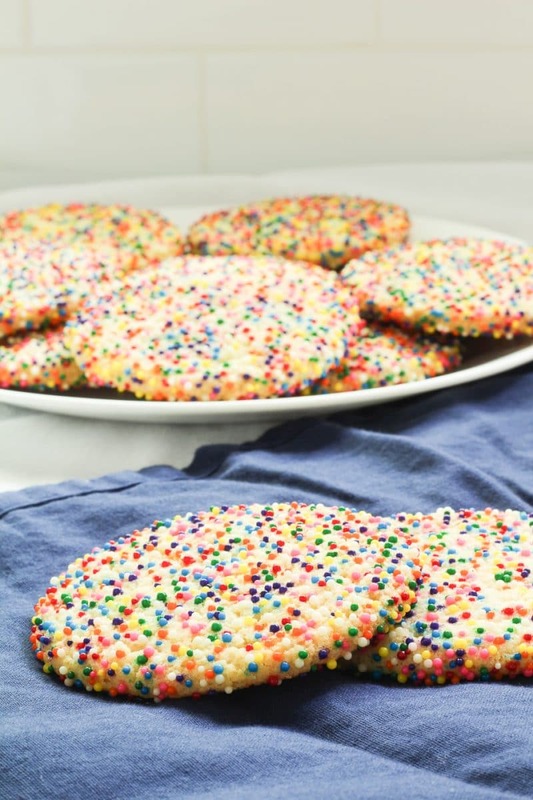 Soft and chewy sprinkle cookies are a fun addition to any cookie tray. Easy to make and beautiful to look at. 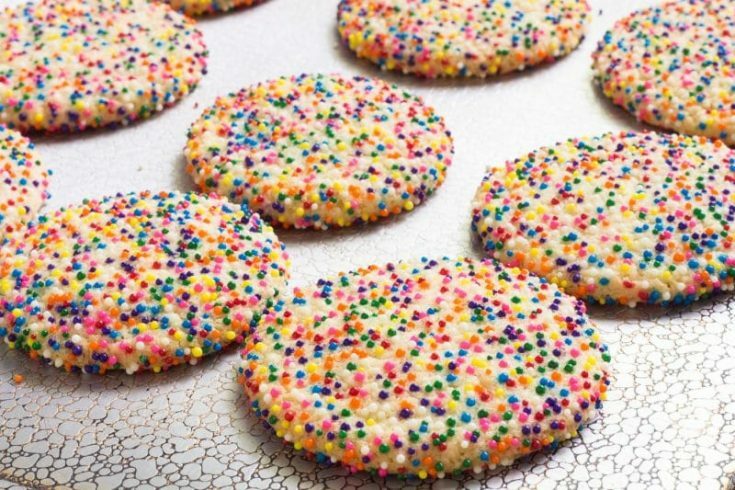 These sprinkle cookies remind me of the rainbow sprinkle polvorones found at the local Mexican Bakery around the corner, but way less crumbly. This recipe is also a tad bit sweeter and chewier than polvorones found at panaderías. I love all of the treats from a Mexican bakery, but I have to admit I am overwhelmed by all the choices when I go. Have you ever been to a Mexican bakery? If you haven’t, it is an experience I encourage you to try if you ever find yourself near one. If you have been to one, leave a comment to let us know which part of the country it is in and what your favorite treat is! My favorite treat is probably ALL OF THEM! 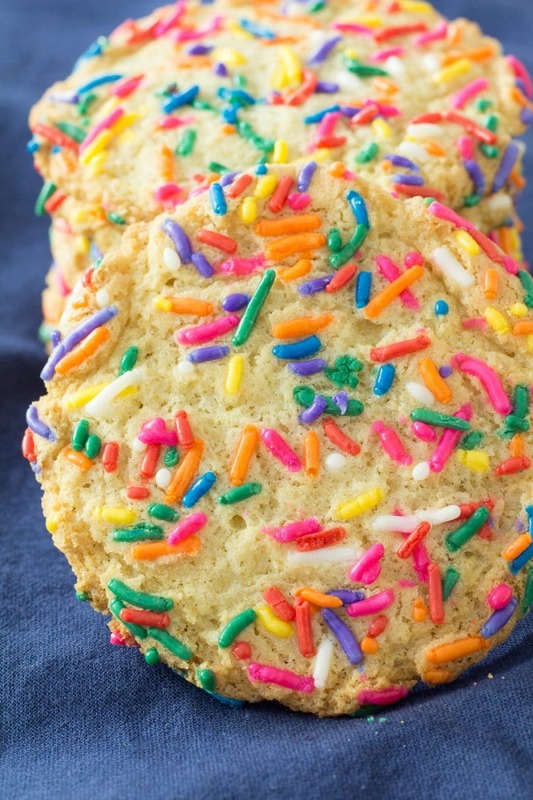 Our recipe for sprinkle cookies starts with a snickerdoodle cookie dough. Using a snickerdoodle base means that there is cream of tartar in this recipe. Cream of tartar provides the chewiness and it brings a tartness to the cookie which helps balance out the sweetness of the nonpareils. 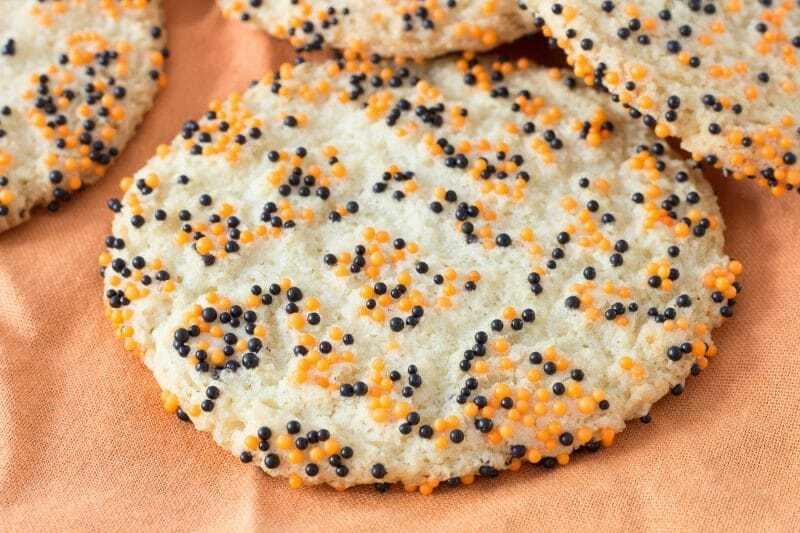 Nonpareils come in an assortment of seasonal colors, changing the colors makes this cookie an all-seasons mainstay. 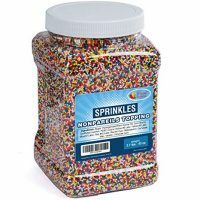 I have seen sprinkles for Halloween, Christmas, summer holidays, and you can even buy them in individual colors and make your own color combinations. One could easily make these cookies in NCAA and NFL colors for tailgating. Even if you have a “house divided” you could easily cookies in both team colors without much trouble. The only change you would need to make would be half in one color and the other half in a different color. 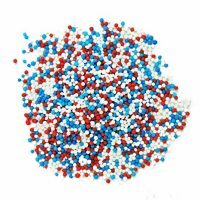 Nonpareils are simply colored sugar balls without flavoring, it is only your imagination that can possibly limit the uses for this cookie. 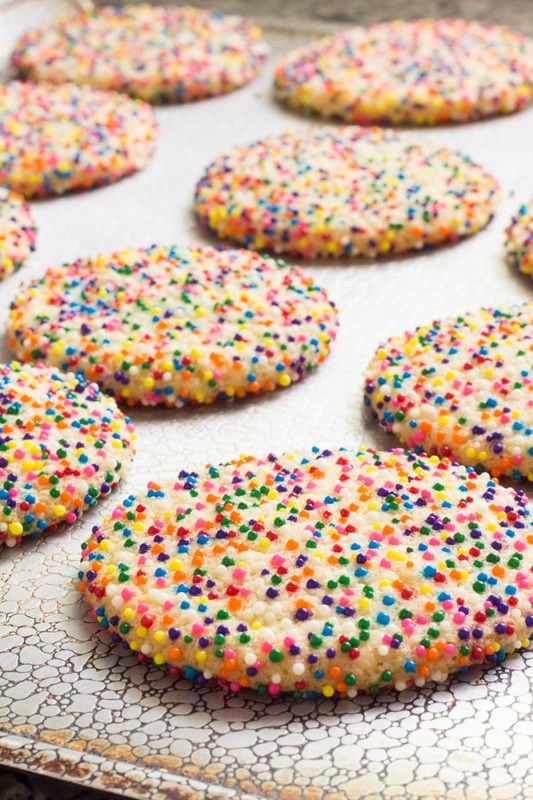 In order to get an even coating of nonpareils around the entire cookie, I find it best to slightly flatten each ball into a disk shape prior to coating with nonpareils. 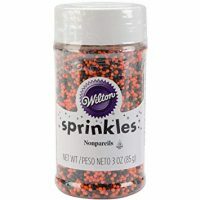 Roll, then flatten and press into nonpareils. 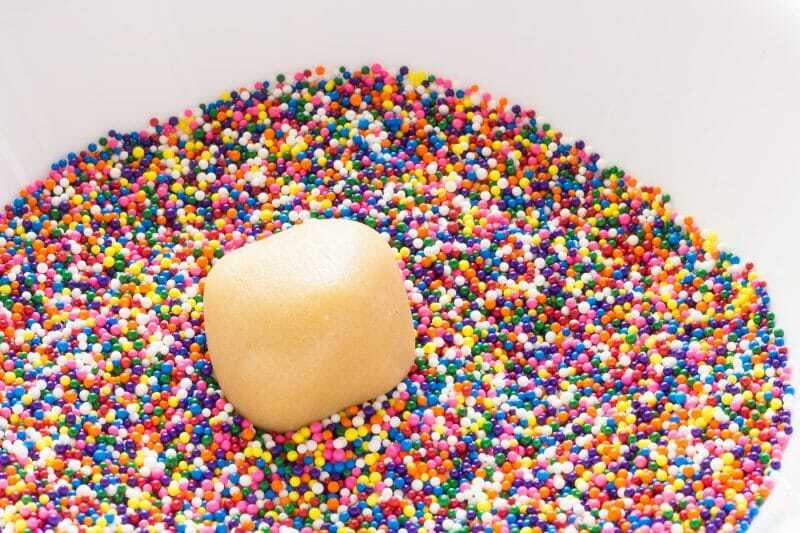 When the dough balls are placed into the nonpareils, press them into the sprinkles. They will need some coaxing to get them to stick. Once they are flattened and both sides have been pressed into the sprinkles, press the edges into the sprinkles to fully coat the dough. Some of the sprinkles may fall off as you place the coated cookies onto the cookie sheet. Sprinkle Cookies really need some space in between them. I give mine at least 2 inches in between, and usually 3 inches between. After coating each disk, I like to press them lightly into the bowl of nonpareils one more time to make sure that there are no naked spots. The dough will puff up slightly and any bare spots will become large areas without sprinkles. Since this is really just our snickerdoodle recipe, make a double batch of dough and make yourself 2 kinds of cookies at once. It’s just a matter of rolling your cookie dough in cinnamon sugar rather than nonpareils. Jimmie Sprinkles are also suitable for this recipe. 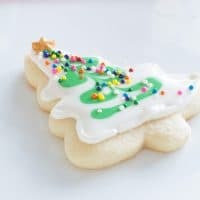 Just about any sprinkle or topping that is used for baking can be used on this cookie. Want a festive and fun plate? Use all different kinds! Experiment. 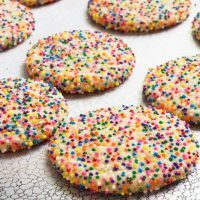 Soft & Chewy Sprinkle Cookies - change colors with the seasons and your mood! In a large bowl, cream together butter, shortening, and sugar, until light and fluffy. Beat in the eggs, one at a time, stopping to scrape down the sides and bottom of the bowl between eggs. In a small bowl, combine flour, cream of tartar, and baking soda. Add this mixture to the butter mixture and blend just until combined. Over mixing makes cookies tough. Place nonpareils in a bowl. Form cookies into balls and slightly flatten balls into small disks. 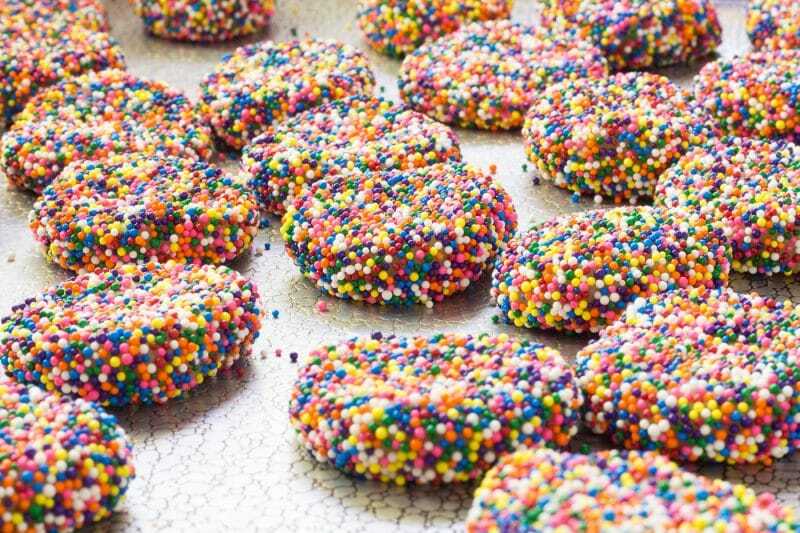 Roll dough disks in nonpareils and lightly press both sides into nonpareils. 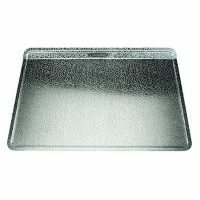 Place on baking sheet about 3 inches apart. Bake cookies at 400 Degrees F for 8 to 12 minutes or until cookies have spread are puffed slightly and do not look wet. You should be able to see some of the cookie dough between nonpareils. Allow cookies to cool on the baking sheet for 1 to 2 minutes. Remove cookies from the baking sheet and place onto a cooling rack. 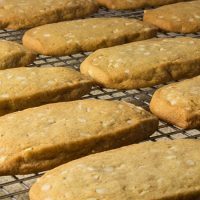 Allow cookies to cool completely before stacking or placing into containers. Any heat left may cause steam and the colors from the nonpareils will stain the other cookies. Caution - May stain your tongue, lips, and fingers. Cream of tartar is optional if you do not like the tartness. Cookies will not be as soft. 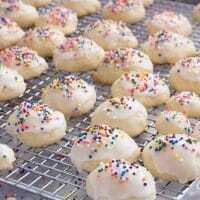 Soft cake-like cookies flavored with almond and vanilla. Old fashioned German cookie with nuts. Not too sweet. Calls for lard but shortening can be substituted. Stays soft for days. 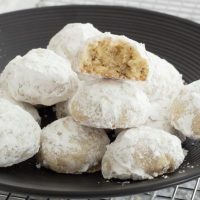 Italian Wedding Cookies are delicious little, powdered sugar coated, butter cookie bites with almonds. 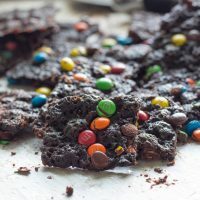 Homemade Brownie Brittle recipe that uses simple pantry ingredients for a chocolaty, thin, crispy and crunchy treat. Make some Brownie Thins today! Thanks for leaving feedback! I’m sorry to hear that you had troubles with these cookies! Great idea just adding sprinkles to the top! These cookies really stuck to the cookie sheet. I ended up putting sprinkles on just the tops. 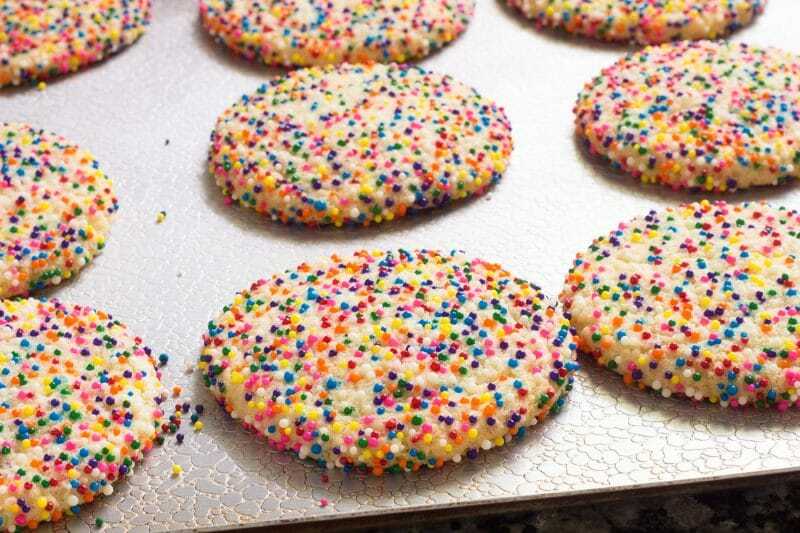 I form the cookie dough into disks and press them into the sprinkles. Simply rolling them in the sprinkles may not do the trick. Let me know if you are still having difficulties after trying that tip. I use the slightly larger ones, but the tiny ones would also work! Do you use the little itty bitty nonperils or the slightly larger ones? I have not frozen these cookies after they were covered with sprinkles. I would probably freeze the dough and add the sprinkles just before baking! I suspect those nonpareils will bleed. Have you ever frozen these cookies? 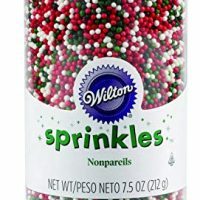 Do the nonpareils bleed when thawed? I get 4 dozen using my smaller cookie scoop. Thanks for stopping by and commenting with your favorite Mexican bakeries! Any favorite treats? The recipe has been updated – add it right after creaming the fats and sugar. Absolutely! All butter would be fine in this cookie! Can you substitute all butter instead of butter and shortening? Thanks! The shortening is added when the softened butter is added. Thanks for catching that error! It has been fixed. I think somethings missing from the instructions to your recipe – when is the shortening added?